(Newser) – A woman hospitalized after she was hit by a falling tree while protecting her three young sons is suing New York City and the Central Park Conservancy for $200 million, WABC reports. According to ABC News, 39-year-old Anne Monoky Goldman was pushing two of her children, ages 4 and 2, in a stroller while her 41-day-old infant was strapped to her chest Aug. 15 in Central Park when a 75-foot-tall elm tree fell on them. Monoky Goldman was pinned under the tree for 10 minutes or so before being rescued. "They had to go take her out with chainsaws," a witness told the New York Daily News at the time. Her lawyers say she suffered spine and neck injuries and a concussion. Her 2-year-old son was treated for a brain hemorrhage and concussion. Should have moved to the suburbs immediately after having the first kid. NYC is not safe for families, or anyone. Bricks fall off buildings and take people out, trees come down because not even the great roots of an oak can find enough support in the sea of concrete. A fifth of the population are rail-thin, pasty, androgynous trust fund hipsters who barely qualify as either male or female due to overabundance of soy in the diet and agendered dress and social trends. City workers will drill through the walls of your apartment while they're doing street work. Most people are either ultra-wealthy or utterly penniless, with no hope of advancement for them or their children's children. It's gone full Brazil/Brave New World out there. "Monoky Goldman was pinned under the tree for 10 minutes or so before being rescued. 'They had to go take her out with chainsaws.'" 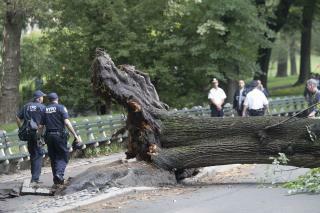 Chainsaw-toting rescue crews routinely patrol Central Park? Who knew? Her lawyer(s) will negotiate with NYC and come away with $70 million for her and $30 million for themselves, and the taxpayers of NYC will take another hit in their collective pocketbooks thanks to the corrupt Mayor De Blasio and the NYC council!